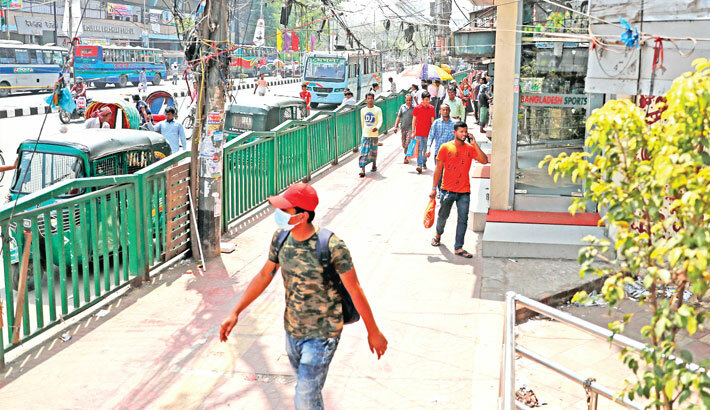 Several thousand street hawkers were evicted from busy roads and footpaths in the capital’s Motijheel, Paltan, Gulistan, Fakirapool and adjacent areas to make the walkways fully accessible to pedestrians. The step has also helped reduce traffic jam in the downtown area of Dhaka. On February 20 this year, Dhaka South City Corporation and Dhaka Metropolitan Police launched a massive eviction drive against illegal encroachment of roads and footpaths in the areas by hawkers. During a recent visit to the areas, the daily sun correspondent found the footpaths and roads of Gulistan Mazar, Zero point, Paltan, Dainik Banglar More and Motijheel free of hawkers. In Gulistan, Paltan and Motijheel, there were hundreds of makeshift shops selling items like shoes, electric parts, fabrics, clothes, fruits, watch, spectacle, old mobile phones and other electric items. Talking to this correspondent, a number of pedestrians said that after a long time they can now walk on the footpaths without any hassle. “It was difficult to walk on Gulistan footpaths as hundreds of hawkers used to lay their products on the roads and footpaths making most of the footpaths blocked. But now the areas are totally free of any hawkers. It’s hard to believe,” said Hasibul Hasan, a student of Jagannath University. According to an estimate of Dhaka South City Corporation, in Motijheel and adjacent areas, there were around 3,500 hawkers. However, the number of hawkers in the areas was much higher than the estimates. In the beginning, street vendors and hawkers used to reoccupy the footpaths a few days after drives conducted by the city corporation authorities and DMP. At the beginning of the crackdown, police and vendors played hide and seek game as the vendors would encroach roads and footpaths once the law enforcers disappeared from the scene, traders of Paltan told the correspondent. Influential political leaders of ruling Awami League including a DSCC councillor backed the vendor in exchange money but this trick is not working any longer. The hawkers now stage human chains in front of the press club, locals said. In the meantime, Bangladesh Hawkers’ union, Bangladesh Chinnomul Hawkers Somity, Bangladesh Hawkers Sangram Parisad and Bangladesh Awami Hawkers league are voicing concerns against the eviction drive against hawkers. Leaders of a number of hawker’s organizations now are waging movements against the eviction drive, backed by some ruling party leaders, and demanding rehabilitation of the hawkers. Hawker leaders said the government has been asking the local government ministry to rehabilitate the hawkers before evicting since the time of Mayor Mohamad Hanif. Earlier, DSCC in a meeting with stakeholders decided that hawkers can sit with their goods on footpaths on public holidays and after 6:30 pm on the weekdays. But without further discussion with hawker leaders, DSCC and DMP are evicting hawkers from footpaths though the prime minister has directed the authorities to work with all stakeholders so that hawkers are not affected by any decision of the government, said M A Kashem, president of Bangladesh Hawkers Federation and Bangladesh Hawkers League. He also said the local government ministry earlier asked DSCC to take necessary steps for securing an allocation of Tk 9.98 crore to rehabilitate the hawkers, Kashem said. “Assurance was made to rehabilitate hawkers by helping them get jobs aboard by through training and other facilities, and helping them get government jobs as fourth-class staffs,” he said. DSCC also promised to allow hawkers to do business in the holiday markets. It also promised to build a market for hawkers in Sadarghat area but it remained it words only, the hawker leaders said, adding that they are demanding for a government policy like in India to allow hawkers the permission to do business on the footpaths. The hawker leaders are planning to wage a movement with a 10-point demand, including rehabilitation. Bangladesh Awami Hawkers league announced a rally of hawkers on Monday.